Now that the Surface Laptop 2 is on the way in a couple weeks, let’s take a moment to reflect on the successes and shortcomings of the original Surface Laptop. Launching in June 2017, the Surface Laptop was Microsoft’s first attempt at a non-convertible clamshell notebook. It was a way to appeal to the fans of the Surface Pro that wanted a bigger screen and an included keyboard, without alienating anyone that can’t afford the Surface Book 2. Without the hybrid form factor, it’s able to remain focused on being a laptop above all else, ditching all the frills Microsoft’s hardware has been known for since the original Surface Pro. Better yet, a recent firmware update has mitigated the battery live concerns of the past, forging improved stability as opposed to the less consistent battery life performance we had before. It isn’t too expensive either, but it comes with the catch of leveraging a new operating system you may not be familiar with – namely Windows 10 S.
That means that right out of the box, you’ll only get access to Windows Store applications, unless you opt to switch out of S Mode. Luckily, this is free for everyone to do, regardless of whether you’re using Windows 10 Pro or Home. Otherwise, the Surface Laptop has been well-received, and it’s not hard to see why either. Unlike the lot of Windows machines out there, the Surface Laptop is worth buying at the most affordable level. Now starting at the same cost as the Surface Pro, you’ll have to decide whether a larger screen is worth sacrificing the versatility of a 2-in-1 form factor. That, and all else considered, let’s take a look at how the Surface Laptop stacks up to its main competitors. Provided the empire Apple has constructed over the years, could the Surface Laptop finally be the one to knock down the MacBook? A premium device commands a premium price tag, and the Surface Laptop now starts at $799 (around £560, AU$1,000) and comes with an Intel Core m3-7Y30 processor, 4GB of RAM and 128GB of SSD storage. However, that model is only available in the US as it stands currently. In order to upgrade to that CPU to an i5, you’ll have to reach a little deeper in your wallet for $999 (£979, AU$1,499). More specifically, that price nets you a 2.5GHz Intel Core i5-7200U, along with the same 4GB of RAM and 128GB SSD in the US, UK and Australia. The next configuration up includes the more powerful Intel Core i7 processor, 8GB of RAM and 256GB SSD for $1,599 (£1,549, AU$2,449). Finally, you can pick up a Microsoft Surface Laptop with an Intel Core i7 processor, 16GB of RAM and 512GB storage for $2,199 (£2,149, AU$3,299). Are these upgrades worth the price hikes? While the doubling of storage space gives it more flexibility, there are cheaper ways of getting more space to save your files to – including cloud services such as Google Drive. However, 16GB of RAM will be tempting to some people who want to use the Surface Laptop for running demanding software or multitasking numerous applications at once. Those users will likely want to upgrade from Windows 10 S – which only allows apps to run if they've been downloaded from the Windows Store – to Windows 10 Pro, which will cost an additional $49 (around £40, AU$65) after December 31 2017 (before then the upgrade is free). For most people, however, the cheapest Surface Laptop configuration should be absolutely fine – especially if you’re using Windows Store apps, which have been vetted and tested by Microsoft. One of the ideas behind Windows 10 S and its restriction to Windows Store apps is that those apps are less resource-hungry than traditional Windows applications, which means they'll run well on lower-power machines, and should drain the battery slower too. The price of the Surface Laptop puts it in the same bracket as last year’s MacBook, as well as the HP Spectre x360 and Dell XPS 13, while offering slightly better specs and power for the base model than the MacBook, but less than the HP and Dell machines. All three of these competitors are worthy adversaries, appearing high up in our list of the best laptops in 2017 – so the Surface Laptop definitely has its work cut out for it. In our hands-on review of the Surface Laptop we suggested that this 13.5-inch machine is quite possibly the most attractive computing product Microsoft has ever created – and now that we've spent more time with it, we stand by that statement. In short, the Surface Laptop is an incredibly attractive machine which shows that Windows laptops can be just as gorgeously designed as Apple products. It features a full aluminum lid and body reminiscent of the Surface Book's, which give it a sturdy yet premium feel. While these keep the Surface Laptop feeling light (more on that in a bit), they also give you confidence that this expensive bit of kit isn’t going to break or dent easily at the merest of knocks. Unlike the Surface Book, the Surface Laptop doesn’t feature an aluminum keyboard – instead Microsoft has opted for plastic keys. Before you start to worry that this could lead to the Surface Laptop feeling a bit cheap, it also features Alcantara fabric material, which is imported from Italy and laser-cut to fit the keyboard and which gives the Surface Laptop a very pleasant feel, especially when typing. The key travel of the Surface Laptop’s keyboard also feels satisfying, with 1.5mm of travel giving you a decent physical response when typing. A cool design feature places the Surface Laptop’s speakers behind the keyboard, using the gaps between the keys as a sort of grille. 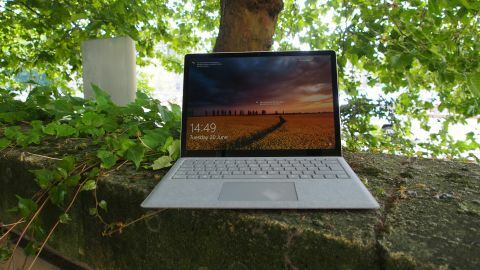 It means the body can remain slim, with no speakers to add to the overall size, and this compromise works very well, with sound from the Surface Laptop coming through loud and clear – though we noticed a bit of muffling when typing at the same time. This may be an issue if you enjoy listening to Spotify while working, but at least the included audio jack allows you to hook up the Surface Laptop to an external speaker. Speaking of ports, the Surface Laptop comes with a USB 3.0 port, Mini DisplayPort and Microsoft's proprietary Surface Connect power and docking port, as found on other Surface devices. The newer, faster USB-C connection is conspicuous by its absence. When we spoke to Microsoft about this, they told us that it intends for connectivity expansion to be handled via its Surface Connect port and Surface Dock. Nevertheless, it’s a shame to see there’s no USB-C port, as an increasing number of peripherals are coming out with this connection, and many of the Surface Laptop’s competitors include it. On the other hand, though, we’re also relieved that Microsoft hasn’t followed Apple’s USB-C or nothing approach. The limited number of ports mean the Surface Laptop can maintain a thin profile – in fact it measures just 14.48mm thick, making it thinner than the Dell XPS 13’s 15mm, though slightly thicker than the MacBook at 13.1mm and the HP Spectre at 13.7mm. So, while it’s not the thinnest laptop around the Surface Laptop is still pretty darn slim, and it weighs just 1.25kg, which is lighter than the Dell’s 1.29kg, though again it’s more weighty than the MacBook, which tips the scales at 1.08kg. Still, it’s impressively light, and easy to hold in one hand. For carrying around, this is one of the most comfortable laptops you can buy. The thinness of the design does have a drawback, however, as the Surface Laptop is incredibly hard to fix, and impossible to upgrade. This was discovered by the iFixit website, which took apart a Surface Laptop and found that many things are either glued in, or soldered to the motherboard, which makes removing and replacing parts extremely difficult. This may not be a worry for some, but if you damage your Surface Laptop, or something goes wrong out of warranty, then it may prove to be quite expensive. The screen is a bright and vibrant 13.5-inch PixelSense touchscreen display, which is reinforced with Corning Gorilla Glass 3 for protection against scratches. The resolution is 2256 x 1504, which gives it a pixel density of 201ppi (pixels per inch). Resolution fans out there (come on, there must be some) will notice the slightly unusual resolution here, which is due to the Surface Pro’s screen having a 3:2 aspect ratio – most laptop (and monitor) aspect ratios are 16:9 (with MacBooks being 16:10). What this means in practice is that the Surface Laptop’s screen is taller, which gives you a bit more screen room when working – though it does mean that if you’re watching widescreen videos you’re going to get larger black bars running along the top and bottom of the screen. The aspect ratio of the screen has implications for the size of the Surface Laptop as well, with the device having a wider body due to it. Overall, though, the Surface Laptop is a fantastic-looking device that will certainly turn heads when you take it out to use it, while still feeling comfortable to work on and carry around. For the best prices on the Microsoft Surface Laptop in Australia, head over to our sister site Getprice and save some dosh!